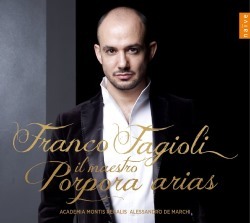 Fresh from his album dedicated to arias written for the castrato Caffarelli, Franco Fagioli now turns to a disc of operatic arias by Nicola Porpora. The composer was also an eminent teacher and his students numbered so spectacular a trio of greats of the age as Caffarelli himself, Senesino and Farinelli. It would be easy to note that more and more counter-tenors are riding the Porpora wagon but when such invitations for virtuosity exist it would be churlish to deny such as Fagioli the opportunity. There are twelve pieces drawn from a variety of sources – six operas, oratorio and cantata - dating from the second quarter of the eighteenth century. Only one, I suspect, will be familiar and Alto giove, from Polifemo, is unusual in this selection because of its expressive breadth and depth. Fagioli is a thrilling counter-tenor with a three-octave range that has impressed in the theatre and on disc, the latter notably in Gluck’s Ezio, Handel’s Teseo and Berenice and Steffani’s Stabat Mater. Even without knowing that his co-star in the Steffani was Cecilia Bartoli, one might be able to deduce her influence on his singing, not least in its highly personalised approach and its virtuosity. Bartoli is a contentious figure but certainly her influence on singers of other voice types – especially operatic counter-tenors and ‘sopranists’ – cannot be minimised. Fagioli responds wholeheartedly to the ebullience, athleticism and sheer brio of the writing, deploying electric trills and tremendous vitality in Se tu la reggi al vola from Ezio revealing his beautifully calibrated floridity. Speed is a part of his arsenal, articulating at dizzying tempi whilst manoeuvring through the divisions seemingly unencumbered by technical concerns. As he shows in Vorrei spiegar l’affanno, he spins the B sections adeptly – and note, too, the soft, dynamics-conscious concern of Alessandro De Marchi and Academia Montis Regalis. The theatrical coup of Già si desta la tempesta, with its wind machine and storm-at-sea machinations, brings the stage to the sitting room. It’s when one turns to Torbido intorno al core from Meride e Selinunte that one discerns the Bartoli Effect at its most obvious. Fagioli employs a bel canto approach to phrasing unusual among counter-tenors in this repertoire, and his lavish, rich tone descends to the chest voice in a way that can be disconcerting to those who value, say, Jaroussky’s more refined approach to the operatic repertoire of the time. Which is to say no more than that Fagioli and Jaroussky are wholly different animals, with Fagioli’s mezzo-ish colour offering a very different sound-world. He brings flair, technical accomplishment and vivid stage presence to everything he sings whether carrying the aria or sharing it; the Arcadian winds in Il pastor se torna aprile offer a delightfully succulent souvenir of this fine band, amidst the torrent of vocalising to be savoured. Both Fagioli’s virtues – speed, accuracy, virtuosity, tone colour and exciting panache – and his limitations – questionable taste and over-use of his range – can be heard in Spesso di nubi cinto, taken from Carlo il Calvo. Here the exaggeration of his low voice in the cadential passage is simply grandstanding and reflects poorly on his musical judgement. Still, he is regal in Alto giove, and expressive too, even if I’m not much taken with his taking the line-up in the da capo, nor in his use of the chest voice. These are, to an extent, very personal questions, and throughout the singing and playing are at a very high level indeed. I wish the notes had been fuller and more detailed, but that won’t stop me returning to this imperious example of the counter-tenor’s art.